Everyone deserves a night out with their friends — but sometimes, playing the hostess can be exhausting. Have you been searching for the perfect way to pamper yourself, treat your friends AND enjoy the night? Well, we have the exact experience you have been looking for. Now, you can host a Nova Facials & Fondue Party for yourself and five friends, without any of the hassles that come along with throwing a get together at your own place! Everyone receives Express Facial Treatments. This is the perfect pick-me-up, and everyone leaves feeling pampered, refreshed and looking like the best version of themselves. 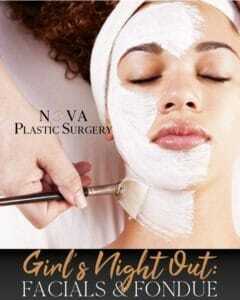 Contact us today to schedule your Nova Facial & Fondue Party!